My 2017 calendar is now available! 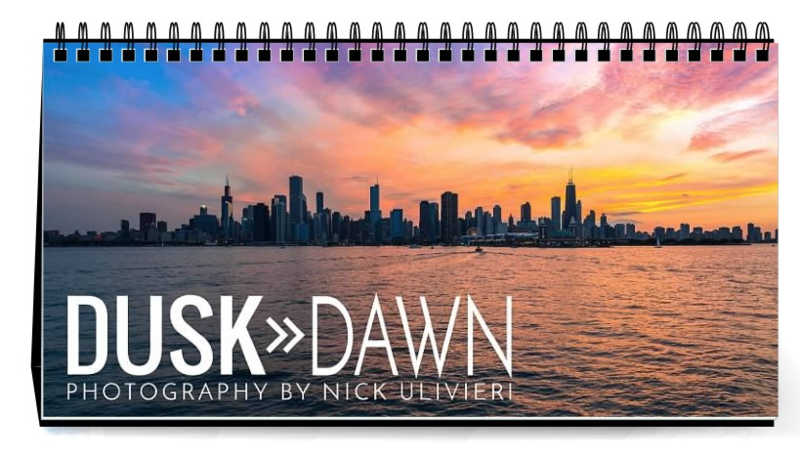 Dusk to Dawn features a wide variety of cityscapes taken at all hours between sunset and sunrise. If you bought one, or received one as a gift, and you’re here to learn more about the photos – thanks for stopping by! If you’re just visiting the blog and you still need a calendar, THIS is where you can buy one. 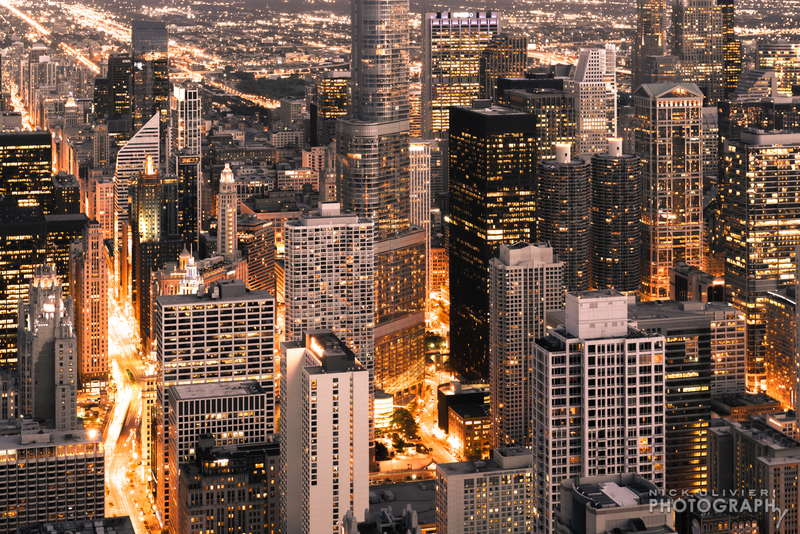 JANUARY: Silver & Gold from the 360 CHICAGO Observatory. I made this photo during one of 360’s #360TripodMondays. In what is a pretty awesome promotion, anyone can bring and use a tripod on the observatory floor every Monday night. 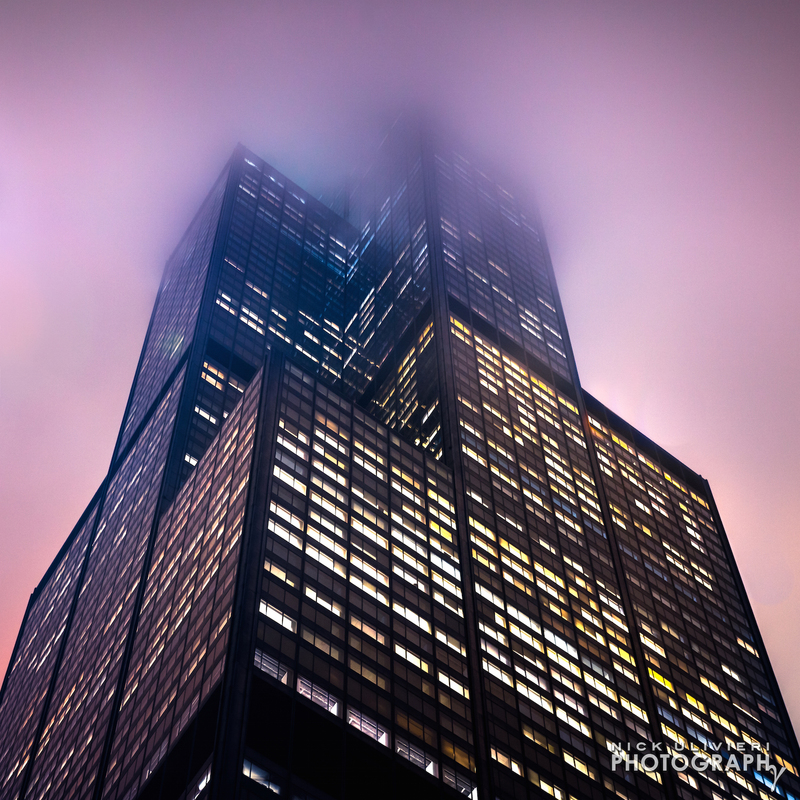 FEBRUARY: Here’s another shot from 360 Chicago on an incredibly foggy night. When conditions are just right, what might look like a dull blanket of fog from the ground, turns into a surreal experience if you’re able to get above it. In this shot, I pushed the colors for a warmer, neon-like look. Here are more shots from that same night. MARCH: Continuing the bold-color theme for one of the least colorful months of the year, March. 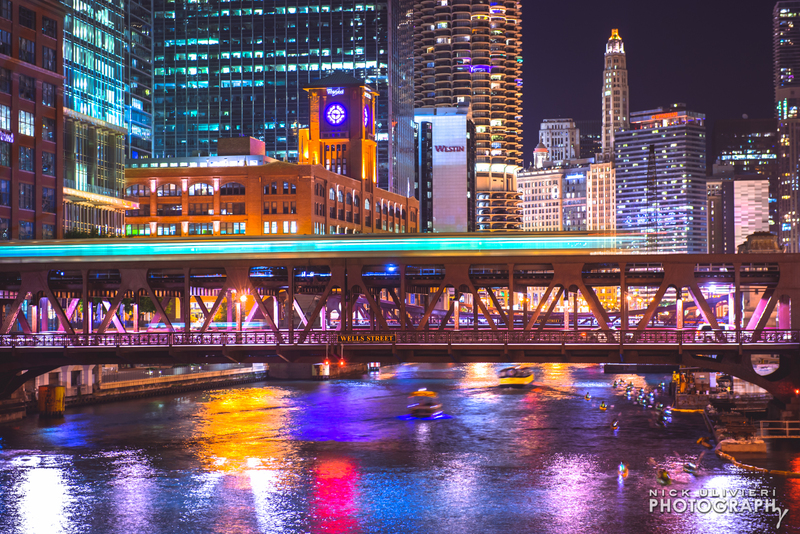 I snagged this shot from the Franklin Street Bridge this past summer while leading a photowalk for the 2016 Out Of Chicago Conference. APRIL: From time to time, certain images beg to be altered. When reviewing this shot, I realized I captured State Street and Adams Street meeting at a perfect 90° angle – something that’s really hard to do from a helicopter. To create something a little more unique I took the image and copied it, then flipped it horizontally. 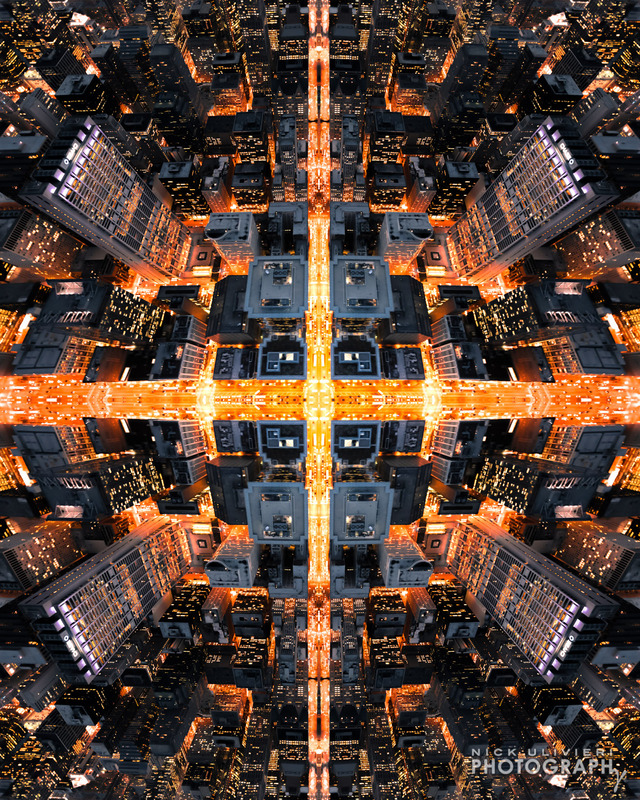 Then I copied that, and flipped them vertically to end up with four quadrants perfectly bisected by brightly lit streets. 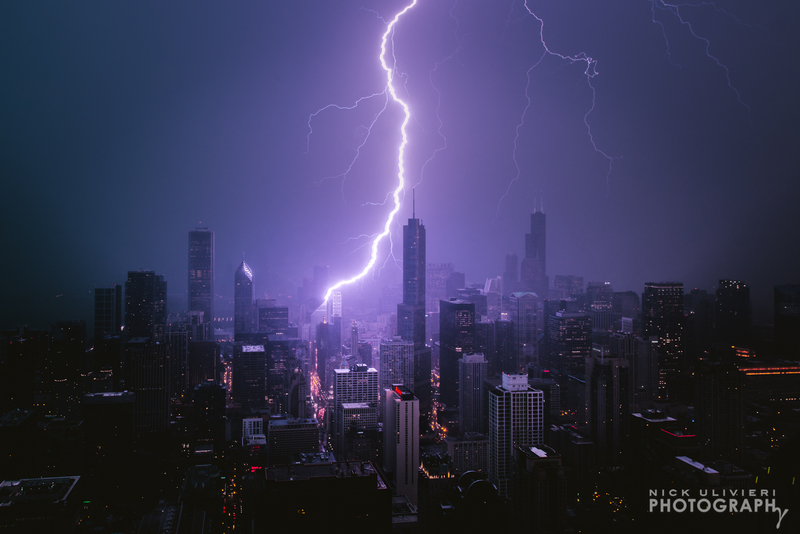 MAY: Not long after the skies darkened and the rain drops began to fall (but before 360 CHICAGO’s windows were covered in water) a giant bolt struck the heart of the Loop. Luckily, my shutter was opened when it hit. What I really love about this photo is how the bolt hit the Crain Communications. The strike brilliantly lights up the lower buildings while adding a degree of depth that I had not yet captured during a storm. By the way, this storm produced an insane amount of sky variety. Here are the photos. 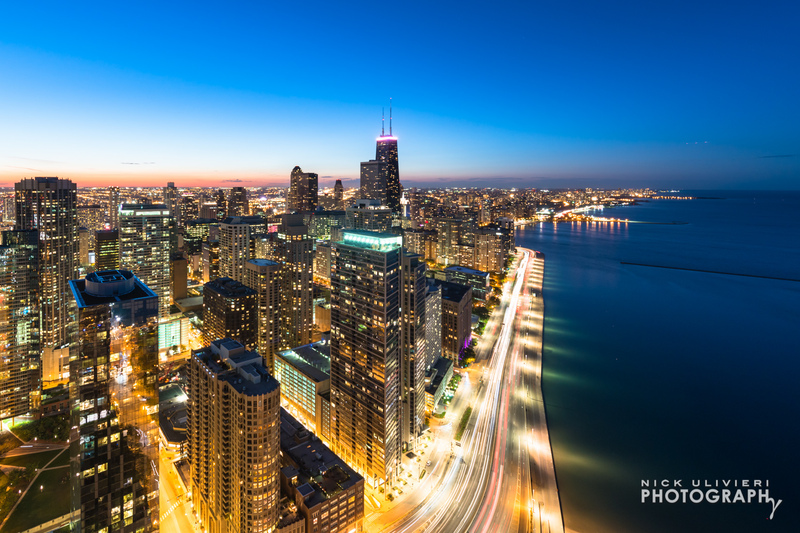 JUNE: Lake Point Tower residents have one of the best views of the city and lake. Thanks to a friendly building manager, I summited the roof for this photo of cars streaking down Lake Shore Drive. JULY: What’s July without fireworks? 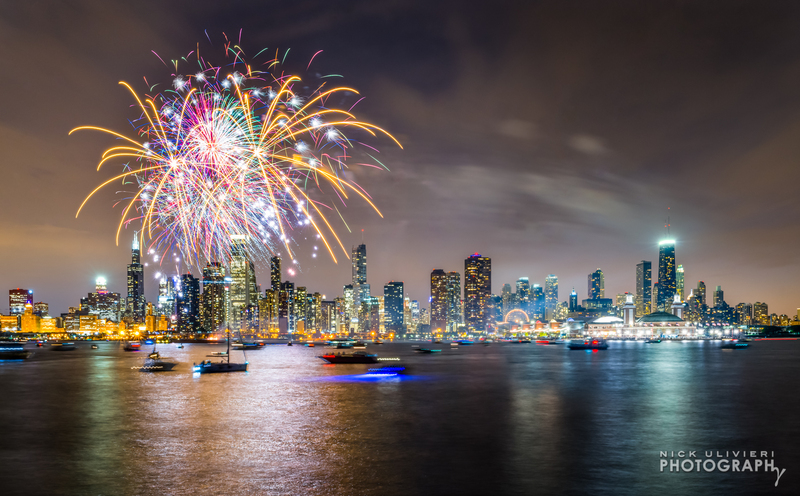 I was lucky enough to work with Navy Pier to create this photo in the summer of 2015. In order to achieve this shot we had to work with the Army Corps of Engineers to receive permission to access the lighthouse. It was definitely one of the more unique locations I’ve shot from. For the full story on how I got out there, read this. 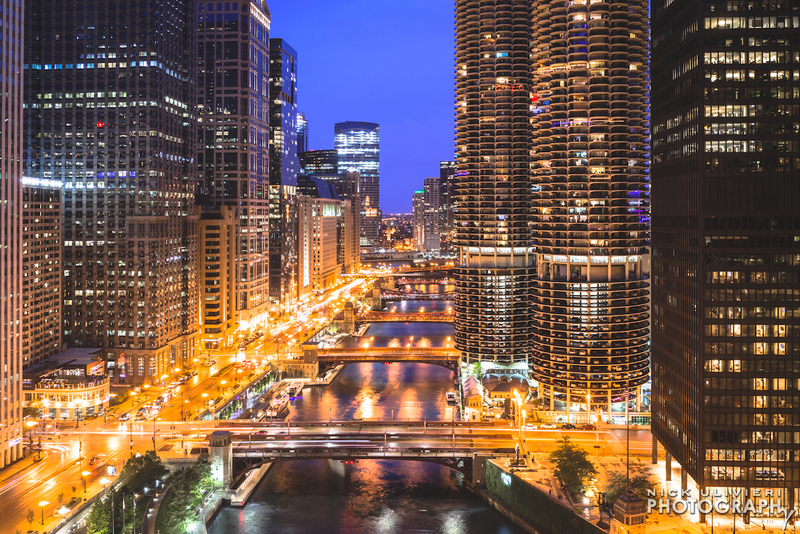 AUGUST: A blue hour view of the Chicago River from atop the newly opened LondonHouse Hotel. Great views and great drinks. 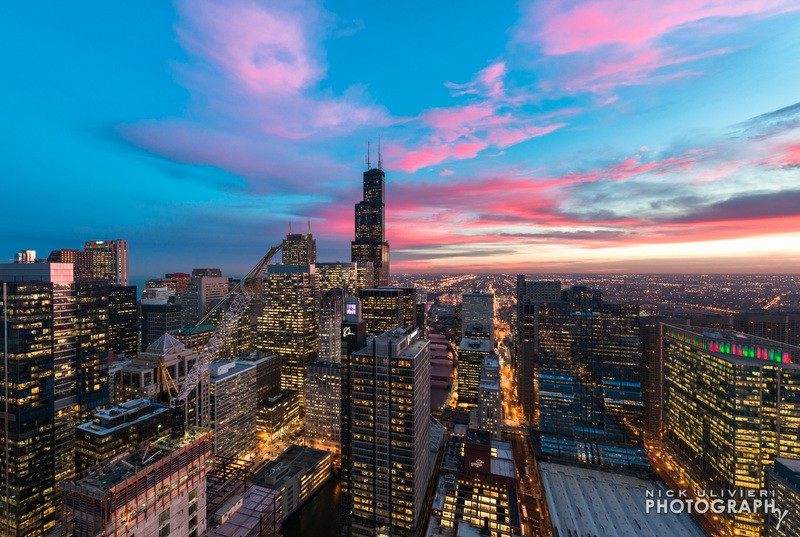 For more rooftop photos check out this blog post. SEPTEMBER: Mornings on the lake are magical – if you get the right sunrise. 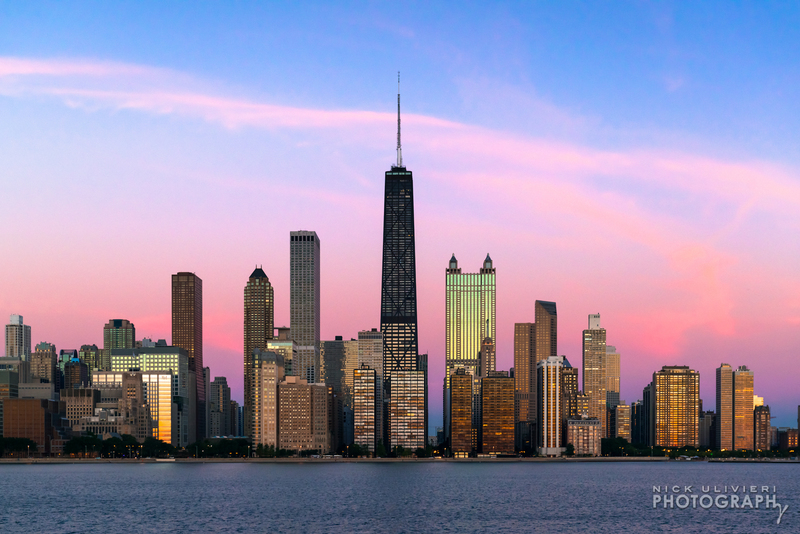 This past summer I teamed up with @Chitecture and Chicago’s First Lady Cruises for an early morning instameet. About 100 area Instagrammers came together to hang out and shoot the sunrise. Here’s what cruisers posted to #ChitectureCruise3. 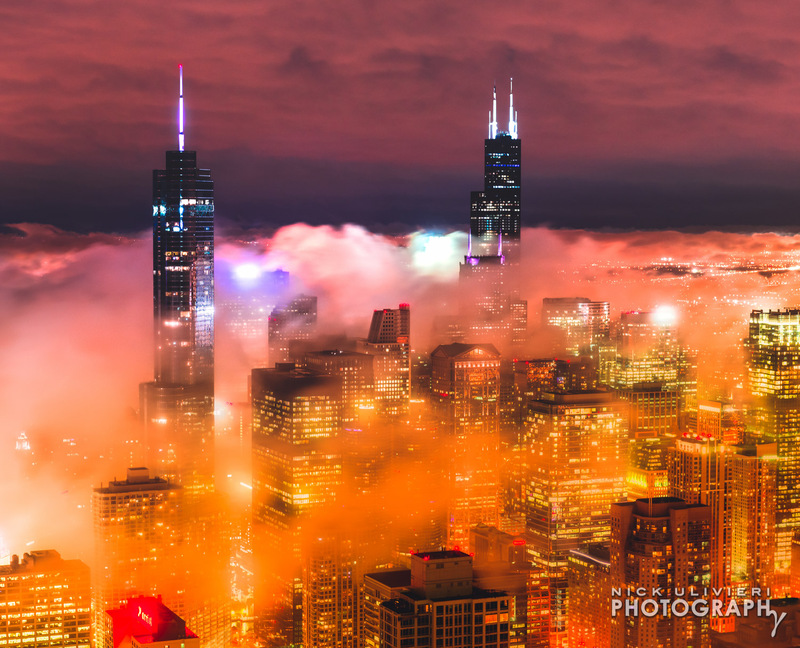 OCTOBER: An eerie blanket of fog blankets Chicago. A fitting scene for October. I’ve always been amazed that we humans can build structures that reach up into the clouds. NOVEMBER: Don’t let the warm colors fool you. This photo was made on a frigid winter morning. Navy Pier juts out in the distance, while low, patch clouds formed by the cold lake rise near the horizon. 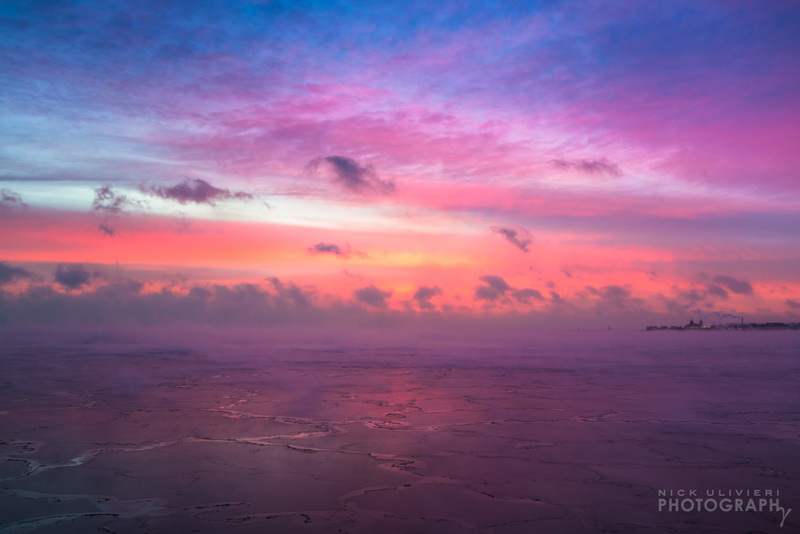 You’ll also notice the sunset colorfully, and softly, reflected in a frozen Lake Michigan. DECEMBER: The sun sets on another year! By the time you get to this photo, it’ll nearly be 2018.